We’d love your help. 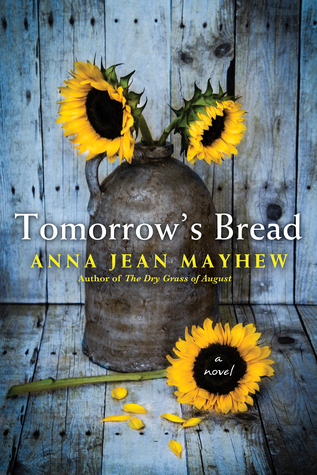 Let us know what’s wrong with this preview of Tomorrow's Bread by Anna Jean Mayhew. In 1961 Charlotte, North Carolina, the predominantly black neighborhood of Brooklyn is a bustling city within a city. Self-contained and vibrant, it has its own restauran From the author of the acclaimed The Dry Grass of August comes a richly researched yet lyrical Southern-set novel that explores the conflicts of gentrification—a moving story of loss, love, and resilience. Published March 26th 2019 by Kensington Publishing Corp.
To ask other readers questions about Tomorrow's Bread, please sign up. I love southern historical fiction, it is one of my favourite genres. In this story the texture of time and place is exceptional and Ms. Mayhew certainly knows her craft. How do you describe a book that’s so well written you can feel what it was like to live in the south during the 60's? My heart soared for the minor successes of the characters in this book and yet I’m saddened by the reality of the past. This book will grab you and within the first few chapters you'll be rooting for Loraylee and all who live in her Brooklyn neighbourhood. This is a brilliant book with fascinating and compelling characters, and a plot that prevents you from putting this book down. It is so well written, it deals with the ugliness of racism in the 1960's in a way that will make you cringe. Lessons about life and humanity perfectly intertwined in this wonderful book. I also loved the music that was popular during the time and the songs mentioned. Anna Jean Mayhew is quickly becoming one of my favourite authors. I highly recommend it. Thank you NetGalley, Kensington Books and Anna Jean Mayhew for the opportunity to read this book in exchange for an impartial review; all opinions are my own. In the 1960s, under the guise of a program called "urban renewal," the nation bulldozed hundreds of black neighborhoods, destroying communities and undermining hard-won racial progress. Anna Jean Mayhew sets her page-turning novel in one of these now-lost communities, the Brooklyn neighborhood of Charlotte, as its residents await its destruction. Mayhew tells the story through three characters. Two are Brooklyn residents – a pastor about to lose his church and a young mother who must hide her re In the 1960s, under the guise of a program called "urban renewal," the nation bulldozed hundreds of black neighborhoods, destroying communities and undermining hard-won racial progress. In the early 60s, many large cities started a plan called urban renewal - it was a way to make space for the new large buildings that they planned in the future. In many places, urban renewal meant displacement of the people who lived in the neighborhoods that were being destroyed to make way for the future. Tomorrow's Bread is about urban renewal in Charlotte, NC, where an entire area was wiped out called Brooklyn. The residents of Brooklyn were mostly black and poor but they had a community of In the early 60s, many large cities started a plan called urban renewal - it was a way to make space for the new large buildings that they planned in the future. In many places, urban renewal meant displacement of the people who lived in the neighborhoods that were being destroyed to make way for the future. Tomorrow's Bread is about urban renewal in Charlotte, NC, where an entire area was wiped out called Brooklyn. The residents of Brooklyn were mostly black and poor but they had a community of friends and a pride in their area that had existed there since the end of the civil war. This story is told from three viewpoints - Loraylee who lives in a home with her mother, her uncle and her son. She is in love with the white manager of the cafeteria she works at and he is the father of her son - something that had to stay secret during this time. Pastor Ebenezer Polk is the leader of a church that will be demolished with a graveyard that must be moved. There is also a white viewpoint from the wife of one of the men on the planning board who are in charge of the demolition of Brooklyn. She feels the wrongness but knows that there is little she can do. With these three divergent voices, we learn about how urban renewal will affect the families of the people who have lived in Brooklyn for generations. I especially enjoyed the life journey that Loraylee was on. She worked full time, took care of her son and her senile mother but still tried to do the best she could for her neighbors and friends. She knew that leaving Brooklyn would be difficult because generations had lived there and supported each other through the years. 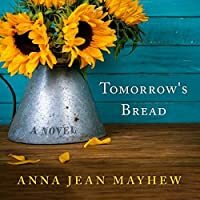 Anna Jean Mayhew's latest novel, TOMORROW'S BREAD, is a work of southern fiction that pulls quietly, persistently at the heart. The story's time is 1961, the setting an almost all black community nestled within the greater city of Charlotte, North Carolina, known as Brooklyn, a self-sufficient, thriving, close knit neighborhood where families have lived for generations. Times are changing, progress is on the march and with it comes the idea that Brooklyn is not good for Charlotte. "Blight" is th Anna Jean Mayhew's latest novel, TOMORROW'S BREAD, is a work of southern fiction that pulls quietly, persistently at the heart. The story's time is 1961, the setting an almost all black community nestled within the greater city of Charlotte, North Carolina, known as Brooklyn, a self-sufficient, thriving, close knit neighborhood where families have lived for generations. Times are changing, progress is on the march and with it comes the idea that Brooklyn is not good for Charlotte. "Blight" is the word used to describe the area, yet for those who only know it as home, it is their safe haven. Houses are to be torn down, residents moved from the only place they've ever lived, and their sense of unity, belonging, is sure to be broken. It is shocking, what will they do? Where will they go? Mayhew perfectly captures the essence of how this must seem to the inhabitants with this quote at the beginning of one of her chapters. It is from Langston Hughes who said, "Misery is when you heard on the radio that the neighborhood you live in is a slum, but you always thought it was home." The Langston Hughes poems at the beginning of the book and at the end say it all about this beautiful, touching book. The city and some businessmen shoved these people out of their homes without giving them enough to This was a wonderful family story, if sad in ways, but this family truly shows you what it means to be a family. "Home will never again be Brown Street, Charlotte 2, North Carolina, where I was born in 1936 . . . where Bibi and Uncle Ray brought me up from a baby to the mother I am now. I'm glad Bibi never saw the day when the city say we got to move. She bought and paid for our home working forty years as a maid . . . ."
For me, this book was just okay. The story is told in multiple voices. I didn't think it flowed well. Also, I didn't "feel" the characters. I received an advance copy of this book in a Goodreads giveaway. This is a great story, and the writing is beautiful and poignant. I found Anna Jean Mayhew particuarly skilled at balancing the three unique voices in the novel, especially Loraylee's voice. The historical setting feels real without ever being too much or too showy. You're right there with all the characters from the very beginning. They're all flawed and human, so it's so easy to empathise and root for them. I can count on one hand, two at most, the number of times I've cried while reading a boo This is a great story, and the writing is beautiful and poignant. I found Anna Jean Mayhew particuarly skilled at balancing the three unique voices in the novel, especially Loraylee's voice. The historical setting feels real without ever being too much or too showy. You're right there with all the characters from the very beginning. They're all flawed and human, so it's so easy to empathise and root for them. I can count on one hand, two at most, the number of times I've cried while reading a book. Tomorrow's Bread was one of these books. The saddest events are told beautifully. I'm rating the novel four stars instead of five for very knit-picky reasons. 1) I came across a "let out a breath s/he didn't realise s/he was holding". That's an instant eye-rolling in annoyance moment for me. I believe this should have been edited out. Without these two things, Tomorrow's Bread would be perfect. Don't let yourself be put off by my little annoyances, it's totally worth the read! Disclaimer - I received a free digital copy of this book courtesy of Kensington Books and NetGalley in exchange for an honest review. Ms. Mayhew weaves the stories of several families together in Tomorrow’s Bread. She puts names and faces on the destructive aspect of Urban Renewal, a federal government program in the 1960s tasked to remove “blight” from inner cities. This well-researched novel takes place in the Brooklyn neighborhood of Charlotte, North Carolina in the early 1960s. I think Ms. Mayhew captured the essence of a place and time not so long ago in our history – yet a place that is gone forever. This well-researched Ms. Mayhew weaves the stories of several families together in Tomorrow’s Bread. She puts names and faces on the destructive aspect of Urban Renewal, a federal government program in the 1960s tasked to remove “blight” from inner cities. This well-researched novel takes place in the Brooklyn neighborhood of Charlotte, North Carolina in the early 1960s. I think Ms. Mayhew captured the essence of a place and time not so long ago in our history – yet a place that is gone forever. This well-researched novel is also a must read for anyone trying to get a feel for anywhere Urban Renewal took place. Tomorrow’s Bread made me stop and think – like I never had before – about the people who were displaced by Urban Renewal. They went from living in a sustainable neighborhood with grocery stores, a doctor, a library, and a church all in walking distance to having to look for affordable housing in neighborhoods that offered none of those things. Loraylee, Hawk, Rev. Eben Polk, Bibi, Uncle Ray, and Jonny No Age will stay with me for a long time. In the beginning, this story was a bit confusing about who was who and what was what. Things soon became clearer, however, and it became apparent that this was more a series of character snapshots, than a plot driven story. The characters were interesting enough individuals, and author Anna Jean Mayhew obviously did her research on the destruction of Brooklyn, the largest black neighborhood in Charlotte in the 1960s. It was destroyed in the name of "urban renewal", and the residents were patroni In the beginning, this story was a bit confusing about who was who and what was what. Things soon became clearer, however, and it became apparent that this was more a series of character snapshots, than a plot driven story. The characters were interesting enough individuals, and author Anna Jean Mayhew obviously did her research on the destruction of Brooklyn, the largest black neighborhood in Charlotte in the 1960s. It was destroyed in the name of "urban renewal", and the residents were patronizingly told by white city leaders that it was all for their best, and that the city would help them find new housing. Both were lies. The story really doesn't get into what happened after everyone had to move out, though, only what happened when the main characters had to leave. How well a reader likes this novel will probably depend on how believable they find the characters in it. Personally, I didn't find them totally believable, but, as stated earlier, they were interesting enough, which kept me reading to the end. I was provided an ARC through a Goodreads giveaway. The book provides three separate aspects, which I struggled to get through in the first few chapters. Some important information came a bit later than I would have liked, but once it was all received, everything started making sense and becoming interesting. Overall, it was a good read. I enjoyed the aspect of Persy, being an outsider of the neighborhood bulldozing, yet still being affected by an internal struggle. Loraylee was such a beautiful c I was provided an ARC through a Goodreads giveaway. Overall, it was a good read. I enjoyed the aspect of Persy, being an outsider of the neighborhood bulldozing, yet still being affected by an internal struggle. Loraylee was such a beautiful character, and the way her story was portrayed made me want to give her a hug every time her part came up. And Eden was the perfect portrayal of how someone would feel connected with a pastor. In the South in America the year 1961 still sees a lot of segregation and discrimination is rife. Loraylee lives with family and her young son Hawk whose parentage though suspect is never discussed either within the family or outside. Urban renewal at the time seems to only focus on "black" neighbourhoods considered a blight on the environment due to its neglect, its lack of facilities and curb appeal so hundreds of these neighbourhoods are razed to the ground in the face of "development". When B In the South in America the year 1961 still sees a lot of segregation and discrimination is rife. Loraylee lives with family and her young son Hawk whose parentage though suspect is never discussed either within the family or outside. Urban renewal at the time seems to only focus on "black" neighbourhoods considered a blight on the environment due to its neglect, its lack of facilities and curb appeal so hundreds of these neighbourhoods are razed to the ground in the face of "development". When Brooklyn faces the same fate, how these three residents face them courageously is the story of this book. The end is inevitable but how they handle it with grace and dignity and the sense of survival that brought them this far, is very courageous. I received this book through Goodreads First-reads. This did not influence my review. This is the first book I have read by this author. I had a very hard time getting into it, although he subject matter was quite interesting. This story is about a black neighborhood in North Carolina in the 1960's. In the interest of 'progress' the neighborhood of Brooklyn is scheduled to be demolished for 'up and coming' development. This is the story of the impact this redevelopment has on many of its resident I received this book through Goodreads First-reads. This did not influence my review. Was Urban Renewal the right thing to do? Was the promise that was made just to destroy communities that the government felt threatened by? Was it worth it to displace generations of families? This is the culture and era in Tomorrow's Bread. The characters are fighters and families that are looking to this as a better life. You will enjoy the background interwoven into the story line. I was too young to know or even remember thid situation as I too grew up in a northern neighborhood. You will never Was Urban Renewal the right thing to do? Was the promise that was made just to destroy communities that the government felt threatened by? Was it worth it to displace generations of families? You will enjoy the background interwoven into the story line. I was too young to know or even remember thid situation as I too grew up in a northern neighborhood. You will never forget this tragedy or the characters. The time lapses were not clear at all, the viewpoints were told in third person and first person, all of which made it hard to follow. I read the whole thing because I did like the characters, but they didn't grow a ton and it all just kind of ended. I liked the premise and think the book easily could have been set today rather than the 1950s (sad if you think about it), but it was not my favorite. I really struggled to get into this one. While I appreciate the multiple points of view, I feel as if the narrative jumped around. I also feel as if more character development could have been done. I'm disappointed that I could not relate to the high ratings may others have given this one. *I received an advanced copy of this book in a Goodreads Giveaway. Ms. Mayhew described Charlotte, North Carolina in the 1960's so well, that I could "see" the neighborhood of Brooklyn. This is a touching story of racial divide and so-called urban development told through voices of those living there. I thought this book was interesting and gave true insight into an era long gone. I could feel the tension and understood the characters. Well written and I highly recommend. Amazed by the outdated thinking, old-fashioned ways and somber mood in every chapter of this book. Enjoyed this book a lot. Excellent Book. Historical fiction about a black neighborhood being targeted for revitalization aka destruction during the early 60 in Charlotte NC.